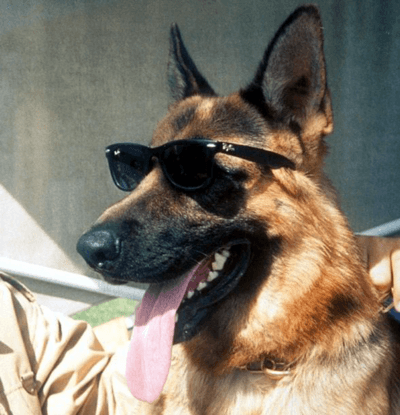 This German Shepherd Is Worth $400 Million, But Wait Until You See Why! Mansions, caviar, limousines – the lifestyle of the rich and powerful is going to the dogs! It’s not every day that a canine arrives to an auction house in Turn-Italy by chauffeur-driven limousine, and yet the German Shepherd named Gunther IV not only attended, but won a 2001 auction for a rare white truffle with the winning bid of 3 million Lira – or roughly $1.1 million. That’s a lof of bones. The bedazzled dog is waited on paw and foot by a personal maid and butler. He eats steak and caviar for dinner at the beck and bark of his human staff, enjoys cool summers in his customized swimming pool, and rides around in a limo as he is brought from one multi-million-dollar home to the next. Gunther’s acquisitions include Estates in the Bahamas, Germany, and Italy, including the $7.5 million dollars Miami home once occupied by pop diva Madonna. It’s nothing short of jaw-dropping, to think that this canine’s gratuitous wealth continues to grow, and yet, it skyrockets. Yes, you read that right. $400 million – thanks to the wise investments of Gunther’s caretakers. So who “owns” Gunther IV? Well, no one, per se. Gunther IV inherited his fortune from his father, Gunther III. Bear with me. It’s not quite as crazy as it sounds. Gunther III was owned by German countess and multi-millionaire Karlotta Leibenstein. Upon her death, Karlotta – a well-known animal lover who was deeply attached to her pets – left her vast fortune of $80 million to her canine companion. Her beloved pet amassed an astronomical fortune, and today that dog’s son (and presumably his son’s son, and so on) is the world’s richest dog. The next richest dogs in the world are owned by Oprah Winfrey, who set up a $30 million trust for her five spoiled canines. Gunther may take home the trophy for the richest hound, but living as the lap dog of luxury isn’t all that’s it cut out to be. Critics of Gunther’s suave lifestyle suggest that moving a dog around from house to house with no permanent “home” can be damaging to a dog’s psyche, just as it would be for a human child. Gunther is said to be a “very high maintenance dog,” and it can be argued that excessive pampering might be creating an animal with behavioral problems. However, it’s undeniable that the dog is loved very much by his caretakers, and he certainly enjoys a life most humans would envy… no if’s, and’s, or woo’s about it. So, tell us: Do you think fame and fortune make for a happier canine, or does love alone foster the joy in man’s best friend?